HWPL is in the process of developing a comprehensive peace program which provides an educational framework for interfaith conflict analysis and resolution, interfaith peace dialogue sessions, and explains how they were able to build alliances between religions through their World Alliance of Religions Peace (WARP) Offices. HWPL will work to design programs and courses to enhance the peacemaking capacities of individuals and organizations from various faiths through WARP Office events and will highlight HWPL’s most recent peacemaking efforts. 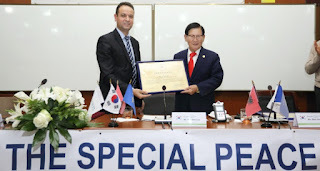 Mr. Man Hee Lee, Chairman of Heavenly Culture, World Peace, Restoration of Light (HWPL) and Chairwoman of the International Women’s Peace Group (IWPG) were invited to the University of Pristina, Kosovo to give a special peace lecture. Man Hee Lee, HWPL Chairman said "You are the future of the world. One individual is weak. But if all youth of the world unite as one, no one would be able to break them apart. And women must unite with the heart of a mother in order to protect our children. When we become one, we can resolve any problem in this world." In the presence of over 400 students and professors, the heads of the university announced future plans to incorporate peace education into their curriculum by establishing the HWPL Peace Education Course. This special course will teach students about HWPL’s peace initiatives and its affiliated organizations’ activities. This will strengthen the solidarity among students to work together to achieve peace in this generation. Chairman Lee’s speech covered the critical tasks and roles of youths in achieving the cessation of all on-going conflicts through properly learning the practical activities which will bring peace. Bajram Kosumi / Former Prime Minister of Kosovo Your work is known all around the world, and you are known as great and strong activists of world peace. The greatest merit for this event belongs to you, Mr. Man Hee Lee and to the organization that you lead. I believe that Mr. Man Hee Lee is a true messenger of peace. If you look at his biography, you will find his hard work, fully committed to world peace. Chairman Man Hee Lee and the HWPL Peace Delegation also visited Haxhi Zeka University where school representatives announced future plans of promoting peace in the University and community and resolved to also become a HWPL Peace Academy. I think that World Peace, this is the best heritage. One person cannot make peace. All of us need to be the messenger of peace to achieve peace.